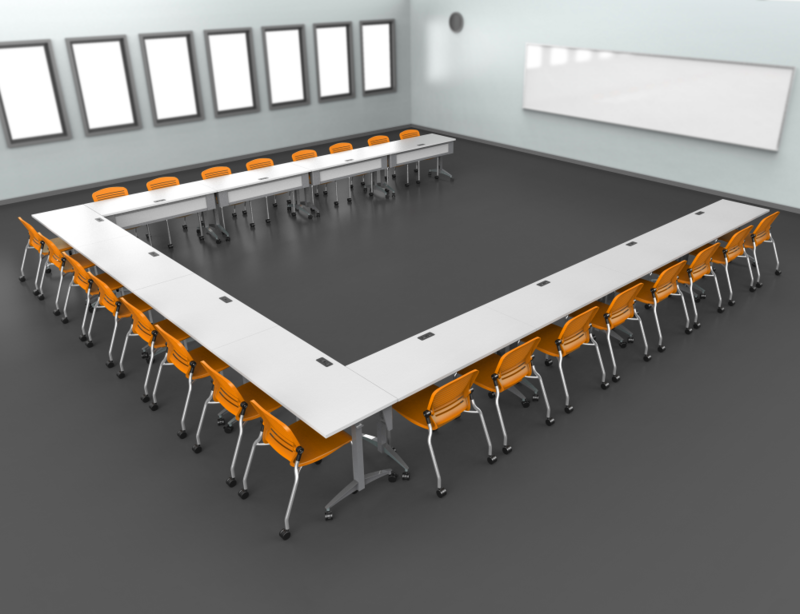 Does your school or company training room need an update? Do you struggle to find an outlet to plug in your laptop or mobile device? With countless products dedicated to connect you with technology, look no further than Spectrum Industries. Spectrum is a niche furniture manufacturer that innovates lecterns, tables, desks, and mobile computing carts. Its products like the Optio Collaboration Table is the perfect solution for your ergonomic, dynamic, collaborative training room. The best part about the Optio Collaboration Table is that you can configure the table exactly as you want it. Its worksurface size, leg style, height, cutouts, and display stand can all be configured. The Table’s AV Technology channel can safely secure and hide all cables and switching boxes, while locking doors on the channel can protect valuable electronics. This table is available with optional casters so you can rearrange the room for the best productivity possible. It also has the ability to support one ADA compliant seat on the radius of each table. In addition, its 48” wide straight tables with the cord channel, can support additional seats along the sides. Spectrum’s OM5 Active Stacker Chair is a perfect match for the Optio Collaboration Table. It offers comfort, style, durability, and the chair’s back can flex allowing you to sit up straight or recline. The Optio Collaboration Table is full of options and can easily connect you with technology, just like Spectrum’s Flex Active Table. The Flex Active Table is available in widths of 48”, 60”, and 72”, and with an optional Power Module paired with the EM Wireless Charging Pad that can charge several devices at the same time. For privacy, the Flex Active Table is available with an optional Modesty Panel that is offered in laminate or metal finish to match your room’s décor. In addition, its scratch and impact resistant high-pressure laminate worksurface is made to last and an optional Power Module has the capability to power devices. The Flex Active Table allows you to engage any user in any environment. With Spectrum’s corporate training tables, your school or company training room can transform instantly.